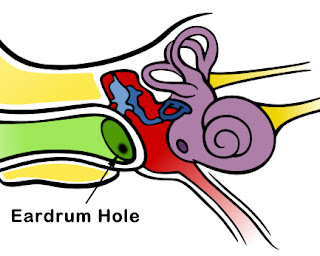 Home » risk » Can Ear Drops Increase Risk of Eardrum Perforation? Can Ear Drops Increase Risk of Eardrum Perforation? With ear tube placement, there is a baseline 2-10% risk that a persistent hole in the eardrum will occur after the tubes come out. However, a study came out in April 2017 suggesting that commonly used antibiotic ear drops to treat ear infections when ear tubes are present may increase the risk of such persistent eardrum perforations after the tubes come out (post-TT TMP). Specifically, antibiotic ear drops belonging to the fluoroquinolone class is associated with an increased risk of persistent eardrum perforation (post-TT TMP) compared to aminoglycoside class of antibiotics. Fluoroquinolone antibiotics include ofloxacin and ciprofloxacin with or without steroids. Aminoglycoside antibiotics typically include cortisporin or neomycin with steroids. The next big question is how much higher is the risk of post-TT TMP with use of fluoroquinolone ear drops? These adjusted hazard risks are based on raw data showing 11 post-TT TMP per 10,000 patient years for non-fluoroquinolone exposure versus 17 post-TT TMP per 10,000 patient years in those exposed to fluoroquinolone antibiotic ear drops. 10,000 patient years is the total sum of observed time during which the incidence of post-TT TMP is observed. For example, if 100 patients are followed for 2 years, that would be 200 patient-years of follow-up. So although it does appear that the risk of post-TT TMP is present with fluoroquinolone antibiotic ear drop usage, the additional risk is not large by any stretch of the imagination and the impact on its use for a given single patient is really quite small overall and should not dissuade from its use. 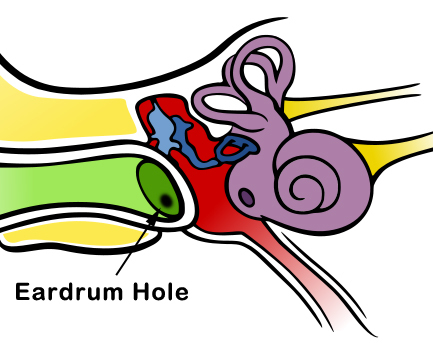 Quinolone Ear Drops After Tympanostomy Tubes and the Risk of Eardrum Perforation: A Retrospective Cohort Study. Clin Infect Dis. 2017 Apr 15;64(8):1052-1058. doi: 10.1093/cid/cix032. Meta-analysis of tympanostomy tube sequelae. Otolaryngol Head Neck Surg. 2001 Apr;124(4):374-80. Factors related to persisting perforations after ventilation tube insertion. Int J Pediatr Otorhinolaryngol. 2016 Feb;81:29-32. doi: 10.1016/j.ijporl.2015.11.028. Epub 2015 Dec 7.